Network Ports (also referred to as Target Ports and Network Interfaces) represent the Ethernet interfaces through which your system is managed and storage is accessed. Client hosts (aka initiators) access SAN storage Storage Volumes (aka targets) via the iSCSI protocol via network ports and NAS file storage which are referred to as Network Shares. 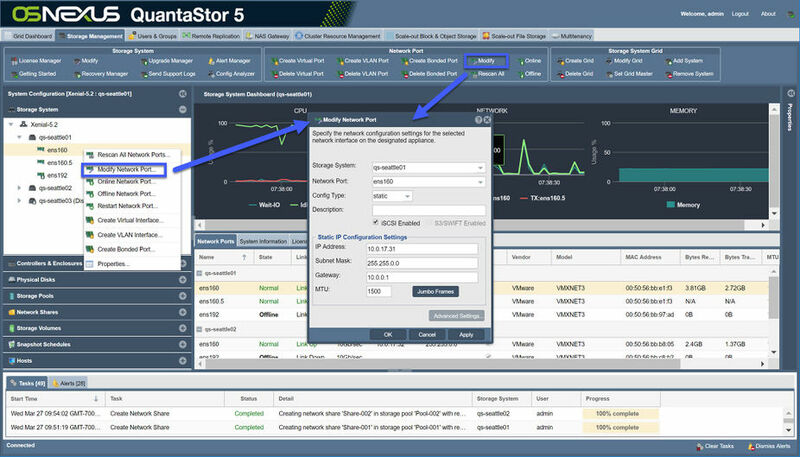 In QuantaStor they are accessible via the NFS and SMB/CIFS protocols via network ports and finally object storage is accessible via network ports. QuantaStor supports both statically assigned IP addresses as well as dynamically assigned (DHCP) addresses. After the initial installation of QuantaStor the eth0 port is typically configured via DHCP with the rest typically disabled. We recommend that one reconfigure all ports with static IP addresses unless the DHCP server is setup to deliver statically assigned addresses via DHCP as identified by MAC address. Network ports setup with DHCP assigned IP addresses run the risk of changing which can lead to outages. To modify the network port right click on the port in question from either left or middle pane. Alternatively left click on Modify in the Network Port toolbar at the top of the screen. To modify the configuration of a network port first select the Storage System section under the main Storage Management tab then select the Network Ports section center of the screen. This section shows the list of all network ports on each system. To modify the configuration of a port, right-click on it and choose Modify Network Port... from the pop-up menu. Alternatively press the "Modify" button in the toolbar at the top of the screen in the "Network Ports" section. Once the "Modify Network Port" dialog appears select the static port type and enter the IP address for the port, network mask, and network gateway for the port. The default MTU should be set to 9000 for all 10GbE and faster network interfaces. If the MTU is changed from the default 1500, be sure that the switch and host side MTU configuration settings are setup to match that of the configured MTU of the QuantaStor system ports for the matching network. QuantaStor supports NIC bonding, also called trunking, which allows one to combine multiple ports together to improve network performance and network fault-tolerance. For all NIC bonding modes except LACP, make sure that all physical ports which are part of the bond are connected to the same network switch. LACP mode will work across switches but it is important to make sure that the switch ports are configured properly to enable LACP. QuantaStor uses a round-robin LACP bonding policy by default but the default is easy to change in the Modify Storage System.. dialog. Round-robin mode provides load balancing and fault tolerance by transmitting packets in sequential order from the first available interface through the last but it doesn't span switches. For optimal fault tolerance LACP 802.3ad Dynamic Link aggregation mode is required as it will span switches ensuring network availability to the bonded port in the event of a switch outage. QuantaStor supports the creation of VLAN ports which are simply virtual ports with VLAN tagging and QoS controls. To create a VLAN port simply right-click on a network port and choose the Create VLAN Interface.. option as shown in the pop-up menu shown at the top of this section. VLANs can be created and deleted at anytime and are easily identified as they are named with a period (.) as a delimiter between the parent port name and the VLAN tag number. For example, a VLAN with ID 56 associated with eth1 will have the name eth1.56. VLANs can also be created on bonded ports which yields ports with names like bond0.56. Virtual ports allow one to use a given physical port on multiple networks with multiple IP addresses simultaneously. To create a virtual port on a physical port simply right-click on it and choose Create Virtual Interface.. from the menu. Note that virtual ports (aka virtual interfaces) can only be attached to physical ports or bonded ports and not other virtual ports or VLAN ports. Virtual ports can be created and deleted at anytime. QuantaStor also has some special virtual ports which are used in High-Availability configurations. You'll see these ports with :ha in the name such as eth0:ha345680. These HA virtual interfaces are associated with specific storage pools and move with the pool when the pool is failed-over to another system. Pools can have many VIPs (virtual ports) assigned to them and as more are assigned the last digit of the port name is incremented from 0, 1, 2, 3, 4 and so on. HA Virtual ports are created by right-clicking on an HA Failover Group in the Storage Pool section and then choosing the Create Virtual Interface.. option. They can also be created via the Cluster Resource Management section. Note also that a cluster heartbeat (aka Site Cluster) must be setup between the systems used to manage a given HA pool before HA VIFs/VIPs may be created. See more on HA cluster setup in the walk-thru guide found here. QuantaStor works with all major 10/25/40/56/100GbE network cards (NICs) from Intel, Mellanox, Cisco, Dell, HPE, SuperMicro, and others. We recommend that one designate slower 1GbE ports as iSCSI disabled which will prevent their use by iSCSI initiators and relegate them for use only with management traffic. Similarly, one should have the 1GbE ports on a separate network from the ports used for NAS traffic so that performance is not impacted by the system using the 1GbE ports by mistake.